Our new "Lafayette" Beaded Curtain is comprised of a nice mix of Large Diamond Beads and Awesome Teardrops alternating on each strand! The beads are all faceted and cut so clean that they really pick up the light very well. You'll get sparkle and shine! The diamonds are 12mm in diameter (that's just about 1/2") and the Teardrops are 30mm long (almost 1.25"). 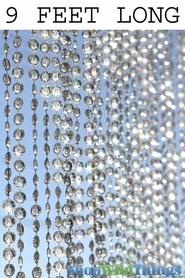 The acrylic used in these curtains are absolutely of the finest high quality bead that you can get. The clarity of the beads is magnificent! 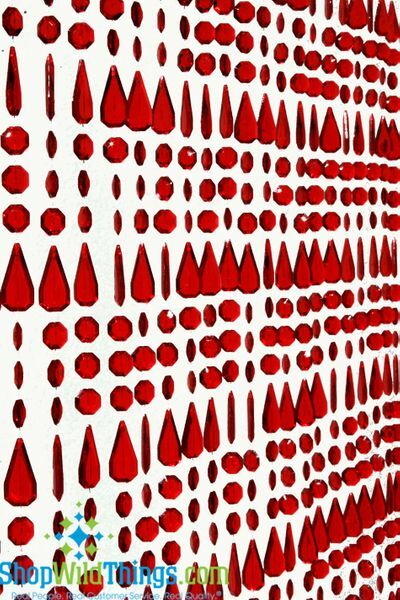 Our RED set of beads is a FANTASTIC rich red color that makes us wish we could paint every room in our house this color. The header rod is a matching red color too! It's so incredibly beautiful. There is NO iridescent coating on this curtain. The beads are see-through. This stunning set of door beads (or room dividers, window coverings, whatever you plan to use them for) features 28 strands of beads. The rod is 35.5" wide and the length from the top of the rod to the bottom of the strands is 72". Folks these beads are so much better in person. My attached pics does no justice here. In case you are a bit confused about the "rod" that belongs to this, well I pulled a few tricks with it. 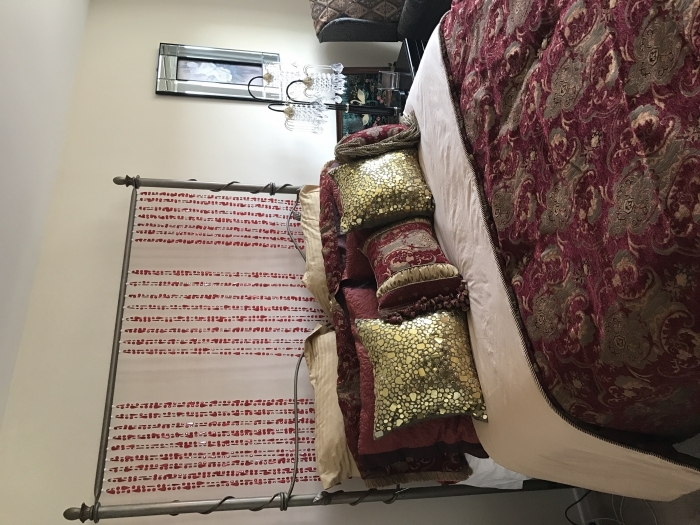 The rod was not long enough to stretch across my bed, so I cut each strand and purchased white mini magnet hooks and folded each beaded strand & draped them on the mini magnetic hook. Merchant Response:Thank you so much for your order!! What a creative way to use the strands from our beaded curtains!! We love to see the wonderful ideas our customers have in action, thank you for sharing. I WANTED A RED CURTAIN FOR THE HOLIDAYS. SO SO PRETTY. 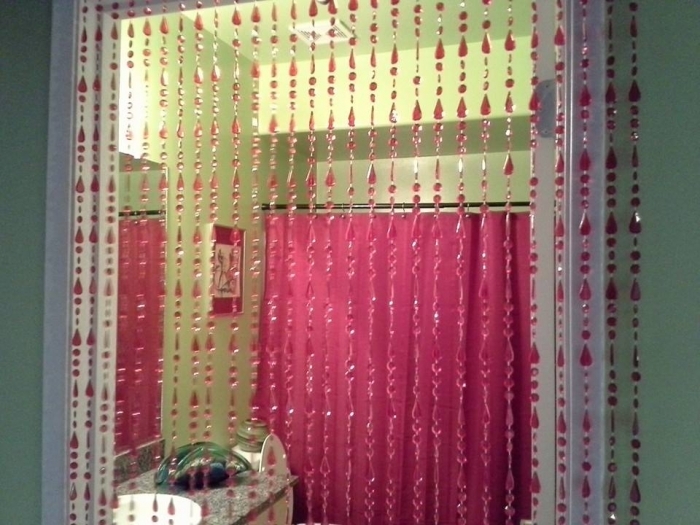 These beads replaced the red string doorway curtain I bought for my husband Valentines day 3 years ago. They are really solid a d I like the sound they make when you pass through them. They are the perfect height as well. I don't have to be concerned about them being stepped on. Beautiful red iridescent beads. I have cut the beads to put in a open white shutter where fabric is usually used. I have used the beads left over to make a valance above the shutter. Absoulutly beautiful. The beads were EXACTLY as seen on the site. They were so easy to put up and I love the finished product. Thanks! ProsEasy to hang and beads are of good quality. Just what I was looking for- excellent quality and super easy installation. The "Lafayette" curtain was just as it looked in pictures. I was very pleased with the quality and the time it took to get it. I especially loved the hand written "Thank You" on the packaging slip and the little Halloween surprise in the box. Great personal touch! Made my day! Thanks! ProsGreat quality, looked just as it did in the pictures and well packaged. Love them. The way they look, the way they tinkle. Want the bead strands closer together so just gonna open it up and more from the second curtain. ProsColor was perfect for the room I placed them in and was very easy to hang. My new bead curtain adds a touch of class to my newly remodeled kitchen. My kitchen has a New Orleans flair to it. Funny the name is Lafayette. There is a city in Louisiana called Lafayette. ProsMy kitchen colors are red, black, silver, and white. ConsNo dislikes. Item is just as I ordered. ProsWhen little children come to visit all u have to do is take down the rod and after they are gone hang it back up! YAY! !